You are here: Home / Knowledge Base / Knowledge Base / Microsoft Office 2016 is Available – Take Action Now! Microsoft Office 2016 is Available – Take Action Now! Microsoft is continuously working to reinvent productivity and to create a world where people can truly make the most of their time, and enterprises, including Public Sector organizations, can empower employees of all generations while remaining in control. Office is at the heart of the Microsoft productivity vision and we are pleased to announce that, in line with this commitment, Microsoft has recently announced the general availability of Office 2016. Office 2016 is Available – Take Action Now! Office is at the heart of our productivity vision and I am pleased to announce that, in line with this commitment, Microsoft has recently announced the general availability of Office 2016. 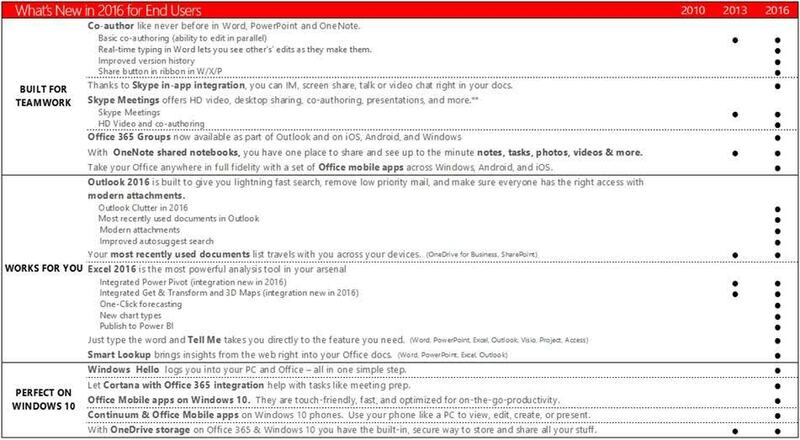 Office 2016 is available in VL; Office 2013 is no longer available. No Price increase in VL for Standard, marginal increase for Professional. Get the latest for the same price. You will need to sell Office 2016 to your customer, this can be downgraded to Office 2013.
https://www.comprompt.co.in/wp-content/uploads/2017/04/comprompt-logo.png 0 0 Web Technology Comprompt https://www.comprompt.co.in/wp-content/uploads/2017/04/comprompt-logo.png Web Technology Comprompt2015-10-06 10:20:552017-01-20 11:06:26Microsoft Office 2016 is Available – Take Action Now!